How do I connect this form with the email I am sending out? We are a group that will be sending out a classified ad type of email to memebers of our community. We created a form on your website to allow members of our community to submit ads that will appear on our emails. How do I connect the two? I imagine that I can just create a link from the email to our jotform account, but I dont know what account info that I would need to do that> I hope I am clear. Can you help me? If what you need is to simply provide a link that redirects to your form so that people who receive your emails with ads can click on it to fill it out, all you need to do is to use the URL of your form and create a hyperlink in the email you will send out. 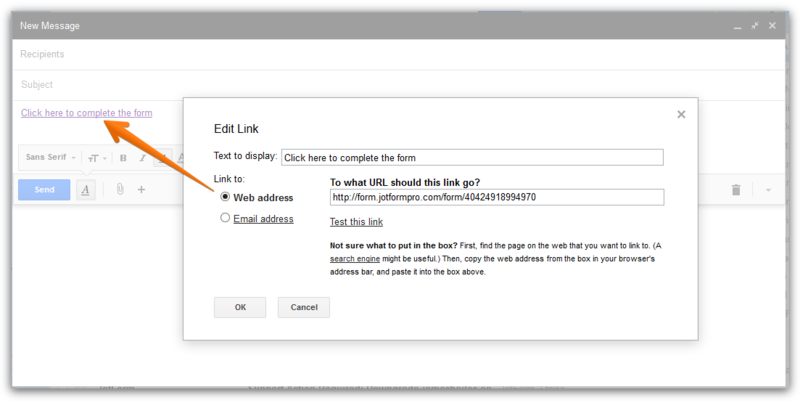 Here is how to get the URL of your form. 1. while editing your form in the form builder click on Preview button. 2. Then, simply get copy the URL that appears in the bar. I hope this helps, however, if this is not what you are looking for, kindly provide further details about what you need so that we can provide you the correct assistance.